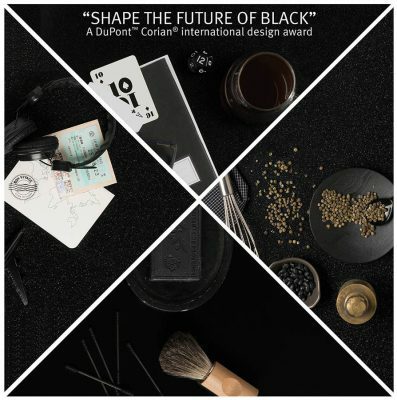 The DuPont™ Corian® business has launched an international design award, called “Shape The Future Of Black”, across the Europe, Middle East and Africa region. The award is open to professionals and students in the fields of architecture, furnishing, interior design, industrial design, general design, decorative arts, engineering and similar disciplines (for further information and to register please visit www.deepcolour.corian.com). – Students from any country in the world, studying architecture, design, engineering, decorative arts or similar subjects at any university or school located in a country in the Europe, Middle East and Africa region. Students must be 18 years old or over. The award is also open to students who graduated during 2013. – Professionals, meaning individuals from any country in the world, working either independently or as members or employees of studios, or industrial or commercial companies, based in any country in the Europe, Middle East and Africa region. Graduates may choose to enter the Professional category if they wish, but may not enter both categories. DuPont™ Corian® should play a fundamental role in these interior design solutions. Students and Professionals must use one or more of the colours from the black tones of DuPont™ Corian® made with the new DeepColour™ Technology* (Deep Nocturne, Deep Night Sky, Deep Black Quartz, Deep Anthracite). Registration is now open and entries will be accepted until 15th June 2014. The winners will be contacted by DuPont in early July 2014. The presentation of awards to the winners will take place in London on September 17th 2014.
by DuPont, and will be exhibited at the DuPont™ Corian® stand at 100% Design in London in 2014 (which takes place from the 17th to the 20th of September). The winning projects will be promoted by DuPont via a variety of communication tools and channels. The jury will include representatives from the architecture and design community, from industry and the media drawn from different countries in the EMEA region, as well as specialists from DuPont™ Corian®. A “popular jury” made up of Facebook fans will also contribute to the voting process. About DeepColour™ Technology* (www.deepcolour.corian.com) – DeepColour™ Technology* (a patent pending invention) is an exciting new option created by DuPont to meet the needs of industrial companies, architects, designers and consumers seeking advanced materials in dark colours offering high performance, elegance, reliability and hygiene. DeepColour™ Technogy* is an innovative manufacturing solution from the research and development laboratories of DuPont. It enables the production of DuPont™ Corian® solid surfaces in dark colours which offer deeper, more intense and durable colour, improved wear performance and easier thermoforming, seaming and finishing. About DuPont™ Corian® (www.corian.com) – First created as a high performance material for kitchen and bathroom worktops, DuPont™ Corian® is now – thanks to its unique combination of functionality, versatility and beauty – a leading global brand among surfacing materials for interior design and architecture. Over the years, DuPont has turned DuPont™ Corian® solid surface into an exceptional design tool for every application one can imagine. Kitchen, bathroom, lighting, furnishing, facades, seating, radiators, home automation, touch control surfaces: today, DuPont™ Corian® can be found almost everywhere in Commercial, Residential and Public Space applications. DuPont™ Corian® has received important certifications for its environmental performance (such as GreenGuard®, NAHB North American Builders Association, US Green Building Council’s LEED® Green Building Rating System, Scientific Certification Systems) and its superior hygienic performance has been certified by independent institutions (like NSF International, Royal Institute of Public Health, LGA QualiTest). Furthermore, DuPont Corian® is the most certified solid surface for building facades (for example it has been awarded the UK certificate CWCT 2012/050, Certification “Avis Technique” ATEC 2/11, Seismic certification by CSTB). All DuPont plants manufacturing DuPont™ Corian® have reduced to zero their impact on landfills by reducing, reusing and recycling, and their environmental management systems have been certified according to ISO 14001.